I’m writing this while I watch the Anzac Day parade on TV. The ranks are thinning – there’s not many veterans left now. My grandfather, Nelson Wellington, was a soldier. Well, how could you be anything else with a name like that? He fought in both wars. He was on his way to Gallipoli on 2 September 1915, aboard the Southland with the 21st Battalion, when it was torpedoed by a German submarine. Forty men were lost. Most of the 1400 men on board took to the life boats, but Nelson remained on board with a volunteer crew of stokers and beached the ship at Mudros, a small port on the Greek island of Lemnos. He then served at Gallipoli, both at Lone Pine, and Quinn’s Post, the hairiest place on the peninsula. From Gallipoli he went to the Western Front, where he was wounded at Ypres. He copped a bullet in the lung, which remained there for the rest of his life, because it was too dangerous to remove. He was awarded the Military Cross. In the second war he was the Commanding Officer of the 2nd/2nd Pioneers, and fought the Vichy French in Syria. Again he was wounded by a piece of shrapnel which shattered his right elbow. The Pioneers took their objective, a small fort at Merdjayoun, and Nelson was awarded the DSO. He was evacuated to the 7th Australian General Hospital where my Father was working. My Mother tells the story in her Memoirs of how bad news arrived by telegram, delivered by the local postmaster. When the postmaster turned up on her doorstep with the dreaded telegram she simply asked: “My husband or my Father?” Nelson had to step down as CO, but fortunately avoided the fate of the Pioneers who were captured by the Japanese in Java and spent the war as POWs, with many ending up on the Burma Railway. 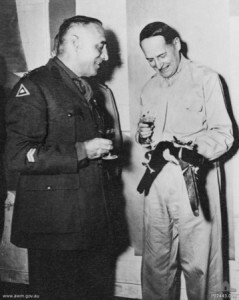 After convalescence and return to Australia Nelson was appointed Australian Liaison Officer to General Douglas Macarthur. But his war was still not over. He was sent on a secret mission to investigate the formation of a paratroop unit to be used in the New Guinea campaign. The plane he was in crash landed at Rockhampton airport and burst into flames. The airstrip was next to a convent and some nuns rushed out and dragged him from the burning wreckage. After his recovery he was convinced the nuns had saved his life and he converted to Roman Catholicism. Nelson had a stroke and collapsed with a thud on the floor of our bathroom in 1952. He died without regaining consciousness three days later in Dandenong Hospital. He had seen a lot of war. He was just 63. It’s hard not to feel emotional on Anzac Day.……….at the going down of the sun and in the morning, we will remember them. It’s a corny and hackneyed phrase, but still appropriate. Lest We Forget. I’m off to Flemington now. I had a panic attack at the Valley a week or two ago – on Easter Monday. My betting instrument froze again. That dreaded white screen appeared and no matter what I did, turning it on and off, it wouldn’t unfreeze. It so unsettled me that I didn’t have another bet all day. I hot-footed it into the Telstra shop at 9 am the very next morning, fearing the worst, a total meltdown. But a very helpful teenager showed me how to unfreeze it. You simply hold down the sleep/wake button and the home button for ten seconds until the Apple logo appears. You then have to enter your SIM password, which is a major barrier to progress, but fortunately I’d written it down on the back of my hand. Bingo. Back in business. And it was only 9.05. So out to Caulfield for the Pink Ribbon Cup. 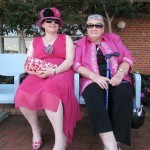 The ladies are sporting lots of pink, to remind us all about breast cancer, that bugger of a disease. And even some of the horses are sporting a pink ribbon. I try to get a photo of the ribbon on that unpredictable recalcitrant, Tears I Cry, and at the instant I press the shutter he swishes his tail. True to form! In the fourth race I quite fancy Off The Planet, but with two minutes to go the horse is showing $1.04 the place on the tote. The bookies have it at $1.55, so I fire up the betting instrument. On the login I stumble over the spelling of my mother’s maiden name and so delete it and re-enter. The phone freezes. The dreaded white screen. But hey, this is no drama. Hold down both buttons, check the faint inscription on the back of my hand, and I’m back in business. They are offering $1.78. Too good to refuse and 0.03 cents above my threshold! So I back it and it rockets home for third. In the last race the favourite Avionics is looking a little agitated. 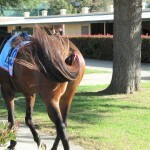 One strapper is walking ahead warning all and sundry to keep clear as “she will kick your head off”. That’s not much of an endorsement for a favourite showing $1.40 for the place on the tote. And the horse is swishing its tail and flattening its ears in a dangerous looking manner and doing little pigroots . I really do like horses to keep four feet on the ground. This horse is sour! A lay, if ever I have seen one! The betting instrument behaves perfectly and I’m set to oppose it at $1.65. Avionics finds all sorts of trouble in the run and finishes last. Two workouts for the iPhone, and two other successful place bets (Reverend Lovejoy and Amaethon), for four out of four for the day. I leave Caulfield feeling pretty pleased. You might say – in the pink. My web site administrator has been exhorting me to provide more information, more lessons on what budding horse watchers should look out for. Less colour and movement. More nitty gritty. So, here beginneth today’s lesson. The nasal strip. 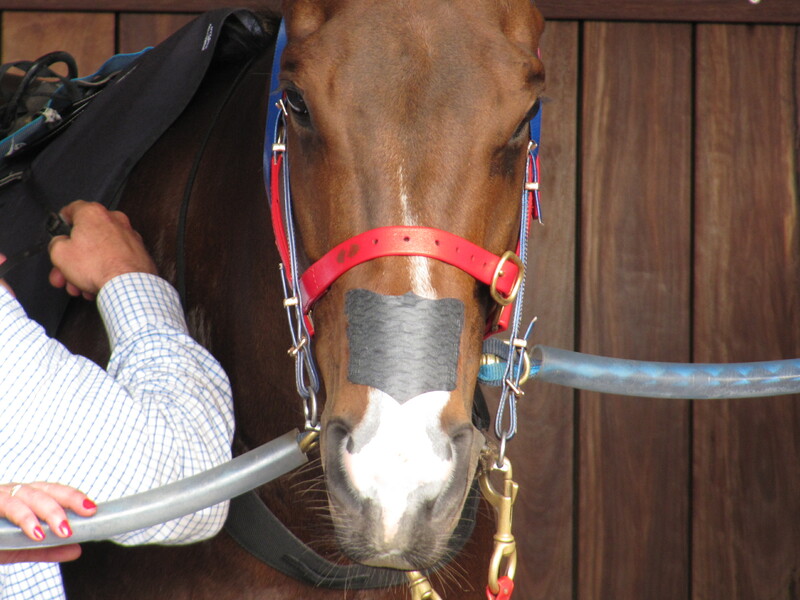 It’s pretty hard to miss if you simply look at the nose of a horse, but is still quite rare on Melbourne’s race tracks. There was one at Flemington today on Uncle Ivan in the seventh race. Nasal strips have only been added to the list of nationally approved gear since 1st April last year. They must be of a design and specification approved by the stewards, with only one currently approved brand, the “Flair” nasal strip. Their method of action is much like the strips used by human athletes – to provide increased air flow through the nasal passage. In the horse the strips support the soft tissues over the nasal passage which helps to reduce airway resistance during exercise. The Flair website has a good Youtube video on how to stick them on. Do they work? A quick check of my database for the last few months shows that I have been to 20 race meetings since 1st January and looked at 1675 horses. I noticed six horses using nasal strips on 11 occasions, for one win and five placings, including Uncle Ivan, who finished third. So, more than 50% strike rate for the place! Not bad! Maybe I should put a watch on them. My usual view on gear of any sort is that the horse has a problem which the trainer is trying to correct. So I much prefer cleanskins. But I’ll keep an open mind on nasal strips until I have more data. At the current rate I should have seen enough horses – 100 is a minimum sample size – by 2014. I’ve got two horses I’m keen to back, Éclair Mystic in the first and Elumino in the last. I cleaned up on both of them last time at Caulfield, so I’m all set for a double dose. And now I’ve missed the connection at Flinders Street and I’m going to be late. I get there just in time to check the place odds on Eclair Mystic, $1.55 with the books, but holding up at $1.90 on the tote. No see, no bet, and Éclair Mystic romps home. And in the last Elumino is $1.65 with the books and $1.80 with one minute to go on the tote. Mr Zeljko decides to back it and it tumbles in to $1.30. No bet. Elumino streets them. I hate being late. It unsettles my whole day. Hello, goodbye.